Need more information on how to improve cell phone reception and boost cellular signal? Well, you've come to the right place. The information we've compiled is from carriers, antenna manufacturers and engineers. Also from results from our customers. You should have a pretty good idea of the best antenna for cell phone signal you need to boost cellular signal after reading this page. In the past, customers had good success connecting external antennas to their cell phones. Unfortunately, today's cell phones do not come equipped with usable external antenna ports anymore. We recommend a powered signal booster instead. They work as "repeaters". They take available signals, amplify them, then rebroadcast the signal through the phone's case. There are many different options available today for vehicles and buildings. For home or office, consider one of our Building Signal Booster Systems. 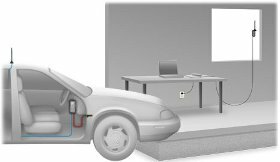 For vehicles, consider one of our mobile signal booster systems. Many 3G and 4G Internet devices have external antenna ports. These ports allow you to connect external antennas to them and improve cellular reception. We do have external antenna adapters for devices like USB Adapters, Hotspots, MiFi Devices. Many cellular routers come with common external antenna connectors. There are a variety of antenna mounting options. Magnetic mount external antennas are the most common antennas used on vehicles. They are simple to install and remove. They are also used in a fixed location at your home or office. Mounting near an outside a window - wherever the signal is best. Some antennas mount on truck mirrors. Pole mount antennas install on mirror posts, pipe or PVC. These are often used on buildings. Hole mount antennas are available for installation though a hole in the vehicle's roof. Adding an external antenna to your cell phone is the most cost effective way to improve reception. The price range for adding an external antenna to your cell phone is about $35 up to over $100. Price depends on the type of antenna, adapter and cable. We also provide antenna kits that include an external antenna and an adapter to connect to your device. You can find these kits by selecting your device make and model in our Machine To Machine (M2M) section. We list antenna kits for many 3G & 4G Internet devices. Can you connect to your device? First, you will need a way to connect an antenna to your phone. Few newer cell phones have port to connect directly to them. Cellular Internet devices like cellular data cards, USB modems, Hotspots / MiFis have RF ports that enable you to connect an antenna directly. Also, some installable vehicle hands-free kits have external antenna adapters built into them. If there is no way to connect an external antenna to your device, you might consider a Wireless Amplifier/Repeater systems that boost cellular signal without needing a direct connection to your phone. 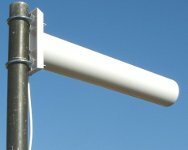 Terrain can have a lot to do with selecting the right antenna. For flat, more open areas, look for higher gain antennas in the 3db to 9db range. They have flatter, wider radiation patterns. 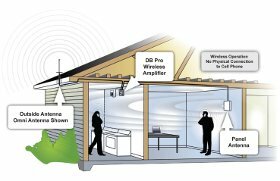 For more hilly areas or areas with obstructions such as trees or buildings, consider a lower gain antenna in the 0db to 3db range. If you travel within different types of areas, consider a 3db to 5db range antenna. Cellular service bands in the U.S. are usually 800MHz range (806-894 MHz), 1900MHz range Digital PCS (1850-1990 MHz), Nextel (806-821 MHz Tx and 851-866 MHz Rx) and GSM 1900MHz. Newer frequencies being used for 4G data are 700MHz LTE and 1700/2100. Some like Clear and Sprint use 2500MHz. Although a cellular device can work on multiple bands, they only work on one band at a time. You may work near a 1900MHz range tower and live near an 800MHz tower. If you want to make sure your covered wherever you go, consider a dual band antenna. If you're not sure of the type of phone network (800MHz, 1900MHz, GMS Range) you're using or having reception problems in, contact your cellular phone Service Provider or local dealer. They will be able find out for you. 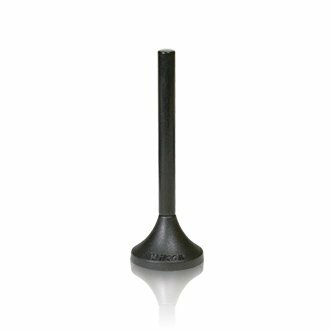 The Wilson Trucker is a very effective all around omni-directional antenna in both 800MHz and 1900MHz digital areas. The Trucker is about 3 foot tall and has a built in ground plane. The built in ground plane makes it a great antenna for applications where a metal ground plane is not available such as homes, offices, RV's and Truck mirrors. The trucker is available in different models for mirror mount on larger trucks and pole mount for home or office use RV's, hole mounts (standard NMO) and car trunk mounts. Many times you can use your phone outside your home but not inside. Many of our customers just use a magnetic base car antenna for good signal improvement. If you need just a little help, consider the Micro Magnetic Antenna Kit. Set the Micro Mag Antenna close to a window and you should see a good improvement in signal strength. (Note: Due to different building construction, not everyone can get reception improvement from placement of the antenna inside.). The Micro Mag is also small and more portable than other options. 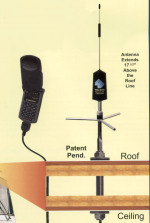 The Wilson Building Mount Antenna is also popular for in home or office use. It has several mounts available and has a built in ground plane. If you need a lot of help such as you get no signal or you cannot make a call at all, you might want to consider a Yagi Antenna. These are directional antenna and are more difficult to install. You might try another antenna first before resorting to the Yagi. Larsen or Wilson antennas perform very well in this range. The Larsen's have heavier duty magnetic bases and thicker ultra low loss cables. They come with a magnetic base or glass mount. If you plan to use it away from the car (home or office), we recommend providing a ground plane such as setting it on a piece of metal, filing cabinet or metallic tape. Glass mount antennas should be used on cars, trucks and vans only. The glass you will be mounting your antenna to should be non tinted and not contain metals which can reduce it's effectiveness. Wilson Electronics also makes very effective, smaller antennas with lighter weight magnetic bases in this category. For more portable use, the Mini Dual Band antenna is very effective in metropolitan areas where large buildings may block your signal. It's small (about 3" tall) and easy to move from place to place. Yagi Antenna: We recommend this antenna for more remote areas. It's not a easy to install and set up as other antennas but they have higher gains. It's a directional antenna so it must be mounted permanently on a pole. You'll have to play around with aiming it in the direction that gives you the best results. 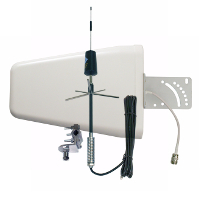 Get more info on Yagi Antennas here. We have many customers that travel about the US in RV's. Most of these motor homes do not have metal roofs which could act as a ground plane for their antenna so an antenna with a built in ground plane or construct a metal plate to mount the antenna on top of. We have a couple more recommendations. Wi-Fi antennas can increase WiFi wireless antenna power. You can cover larger areas or direct WiFi signal towards or from a certain direction. The applications for a WiFi antenna area unlimited. How to improve cell phone reception in areas where the signal is very weak or non existent? Probably the most effective way to improve cellular reception in areas with little on no signal is to attach a direct connect type cellular amplifier to your cell phone. A great to improve cell phone reception for multiple cell phones in small or larger areas, is to install a building cellular repeater system. A basic system is one antenna on the outside, one antenna on the inside, both connected to an amplifier inside. A versatile system that is powerful and portable would be one of Wilson's short range cellular repeater systems.